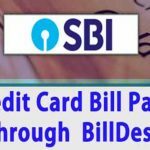 BSNL Land Line, Broadband, WI-MAX Bill Payment Online through Net Banking, Debit Card using Bill Desk Step By Step Procedure. 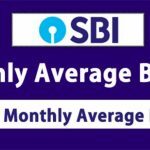 How do you pay your BSNL broadband and Landline monthly Bills…? 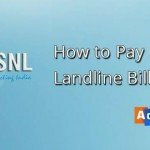 If you are still paying your BSNL bills by waiting in line in a BSNL Customer Care office or in a Post Office, this tutorial is for you. 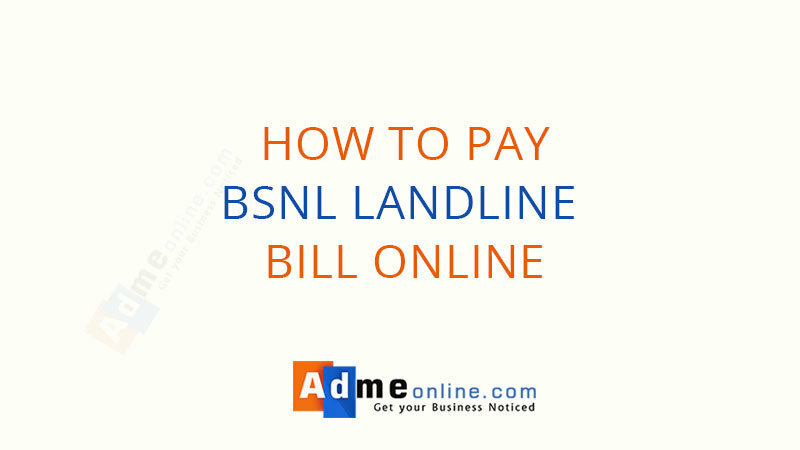 Check below tutorial to learn How to Pay your BSNL Landline Bill Online. 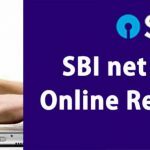 Now BSNL with its advanced portal, allows its customers to pay the Land Line and Broadband bills online at anytime from any where, even the last date for the payment is passed. No need to wait in a queue or arrange your busy schedule to pay the bill!. 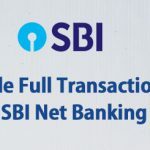 For BSNL Landline and Broadband online bill payment, you need an active Online Banking account / Debit Card / Credit Card and a smartphone or a computer with an internet connection. Step 2 : Click ‘Landline‘ menu, ‘Individual/ FTTH Bills‘ payment option will be selected by default. Enter the Landline No, a Mobile Number and an Email address to receive the payment details. Step 3 : Enter the verification Code shown there, No action required in the option ‘would you Like to remember above information ? ‘ because by default, the Phone number and Contact details will be saved. So you don’t have to enter it again when you pay the bills online next time. Step 4 : Click on the ‘Submit‘ button. Now you can see the Bill details, including Customer Name, Amount, Due date, BSNL Account Number etc. Step 5 : Verify the details and Click ‘Pay Now‘. Now you can select the Payment Method. You can pay the bills by using Net Banking, Debit Card, Credit Card or Cash Card (Through BillDesk Payment Gateway). Step 6 : Select the payment method (Select the bank name, if you want pay by using the Net banking), else select your Credit or Debit Card type. Step 8 : Complete the payment with the selected payment method (If you have selected Net Banking, then login your Internet banking Account and complete the payment, If you have selected Credit / Debit card, then enter the Card No and CVV Code, Card expiry date etc and complete the payment. Step 9 : Once the payment is completed, you will get a Payment confirmation Email and SMS. 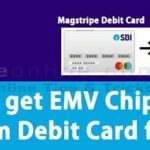 Now you can download or print the payment details if required. 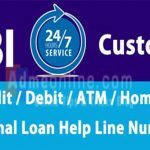 Next time, when you pay the BSNL Landline Bill Online, you can complete it with in 3 minutes because your details already saved in the BSNL portal. You can pay your BSNL WiMAX Bills Online through the BSNL Portal without registration. 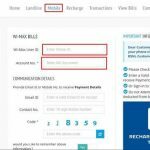 Follow below steps for the BSNL WiMAX Bill Payment Online. Then Enter your communication details (Email and Contact Number). Enter the captcha code and then Click on the ‘Submit‘ button. 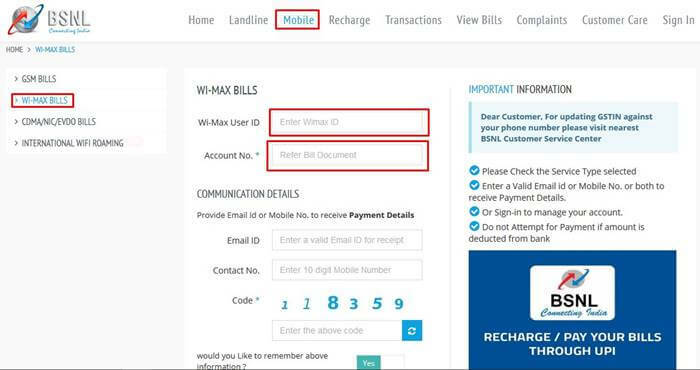 Now you will be redirected to a page with your Wi-Max Bill details including your Customer Name, Account Number, Bill Amount, Due Date etc can be seen there. Verify the details and Click on the ‘Pay Now’ button to complete the payment using any Payment Gateway available in the portal. 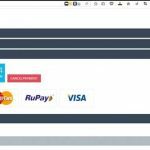 After the successful payment, you will get a confirmation Mail and SMS. 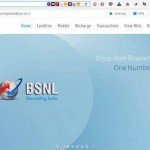 You can pay your BSNL Broadband Bills online using the same above method, without Registration. When you enter your Phone Number, you can see your BSNL Broadband as well as the Land line Bill details. 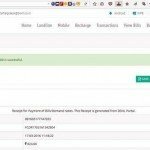 You can complete the payment using BillDesk or Tech Process. 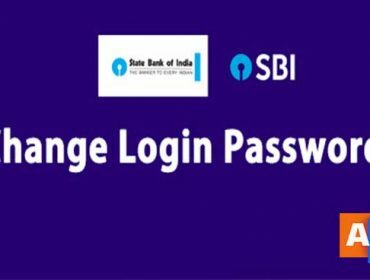 If you want to view your BSNL Bills, You have to create an account in the portal. 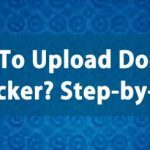 When you signup, you will get a User Name and Password. 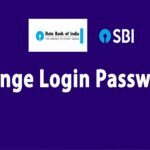 You can Login your account at any time and view/pay the BSNL Land Line, Broadband, Mobile, WiMAX etc bills online using the Payment Gateways provided in the Portal. 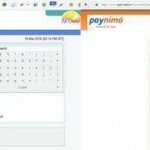 You can pay your BSNL Land Line and Broadband bills through Paytm. 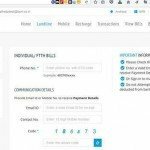 Visit Paytm and Select BSNL as the Operator in the Land Line Bill payment section. Then Enter your BSNL Landline Number with STD Code without 0. Now you can see your Bill Details and Pay the Bill Using your Paytm account. 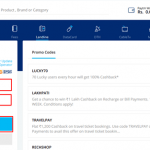 For BSNL Bill Payment, Paytm offers following Promo Codes.  LUCKY70 – By using this Promo Code, 70 Lucky users in every hour will get their cash back. 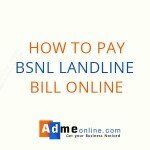 If you have any questions or doubts regarding the BSNL online bill payment, feel free to comment below. 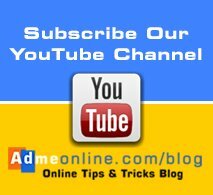 Also share this video tutorials with your friends and family members. Please Follow us on Social Medias.